Planning on spending a week in Paris? There’s so much to see and do but with this guide you’ll know exactly what to do in Paris for a week. 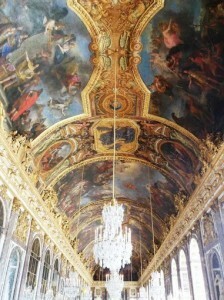 The Louvre Museum – Containing over 35,000 masterpieces, the Louvre is the most visited museum in the world. Home to the Mona Lisa, Liberty Leading the People, and The Raft of the Medusa. The Eiffel Tower – The most symbolic monument of French culture, the Eiffel Tower is a must see in Paris. Admire from ground level, or make the adventure to the top! Bateaux-Mouches Dinner Cruise – This is the perfect way to end a long day. 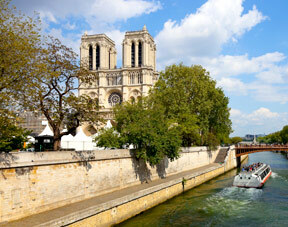 Board a Bateaux-Mouches on the Seine River and enjoy a delicious meal while gazing at Paris from the river. Notre-Dame Cathedral – Taking over a hundred years to complete, Notre-Dame Cathedral is majestic with its stained glass windows, gothic architecture, and gargoyles. Enter the cathedral for free, or climb the towers for and incredible view of Paris for an additional cost. Musée d’Orsay – Originally a railway station, the Musée d’Orsay is now home to numerous impressionist paintings from artists including Van Gogh, Renoir, and Monet. Le Marais – Once the aristocratic neighborhood of Paris, Le Marais is now filled with art galleries, hip fashion, and trendy restaurants. Stop by Place de Vosges which is the oldest planned square in Paris. Père Lachaise Cemetery – From having six people laid to rest the opening year, to over 6000 less than 10 years later, Père Lachaise in the resting place of several famous people. 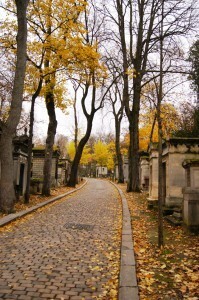 Visit the tombs of Jim Morrison, Oscar Wilde, Chopin, Géricault, Molière, and Balzac. Montmartre – Home to the Moulin Rouge, Sacre-Cœur Basilica, and the Church of St. Pierre, the cobblestone streets of Montmartre are lively! Challenge yourself to make it all the way up the hill to visit the Basilica or choose to ride the ‘petite train’ to the top instead. Grèvin Wax Museum – Comparable to Madame Tussauds, the Grèvin Wax Museum is a great place for children to get their pictures taken with icons like Barack Obama, Pope Francis, Einstein, and Gandhi. Château de Versailles – One of the largest and most luxurious castles in the world, Versailles is a place that you’ll want to spend a whole day at. Stroll through the Hall of Mirrors, and then head to the gardens. Don’t forget to make the small journey to Marie-Antoinette’s cottage and the Grand Trion. L’Arc de Triomphe – Located in the center of the Place Charles de Gaulle, l’Arc de Triomphe is one of Paris’s most famous monuments. 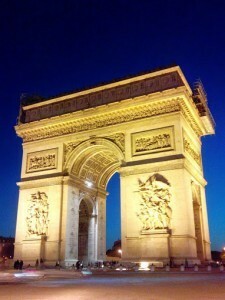 This arc honors everyone who fought and died in the French Revolution and Napoleonic wars. The victories and their generals are inscribed on the surface of the arc. Like the Eiffel Tower, you can admire from ground level, or choose to ascend to the top for a breath-taking view of Paris. Champs Elysée / Montaigne Avenue – To the east of l’Arc de Triomphe, is the Champs Elysée which is lined with several shops, restaurants, parks, and monuments. Branching off from Champs Elysée is Montaigne Avenue. Some of the most luxurious shopping is done on this street and includes stores like Louis Vuitton, Dior, and Chanel. Musée Rodin – Opening in 1919, Musée Rodin is dedicated to display the work of artist Auguste Rodin. Many of Rodin’s sculptures are situated in the garden, while 300 hundred of his works are located in the main mansion, Hôtel Biron. Saint-Michel – Close to the Seine River, Place Saint-Michel is home to the Saint-Michel Fountain and shows a view of Sainte-Chapelle and Palais de Justice. Saint-Michel is full of historical charm. Jardin du Luxembourg – Commissioned by Marie de’ Medici in 1612, the Jardin du Luxembourg is split into two gardes: English and French. 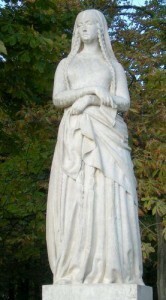 In total, there are 106 statues spread through out the two gardens, along with an apple orchard, fountains, and rose garden. There are many activities for children happening throughout the park as well. Les Invalides – Now the resting place of Napoleon, Les Invalides is a national museum of Paris showcasing everything that anyone would want to know or see about the French Army. In addition to being a war museum, Les Invalides is also include a veterans hospital. The Catacombs – Holding the remains of over six million people, this former limestone mine in Paris, is now an illuminated underground maze. 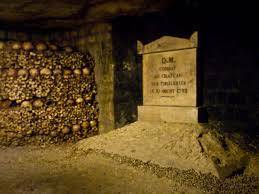 People have been visiting this ossuary since the early 19th century and now people still line up to come and see the carefully place human bones some 40 feet underground.